Lamb is the meat from a sheep which is under a year old. Mutton refers to the tougher flesh from an adult sheep. Lamb is a tender, more delicately flavoured meat that is succulent and juicy. It offers a rich source of iron, and other essential minerals and vitamins. 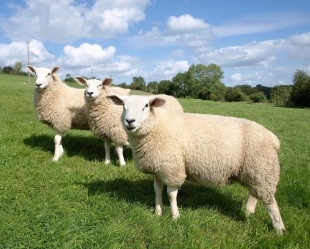 Most lambs are slaughtered between the ages of 4 to 6 months. Lamb has been a dietary staple for many thousands of years. Lambs reared on a farm where they have been allowed to freely roam, without stress and away from pollution will be superior in taste. Naturally grazed animals produce the best flavour and most succulent meat. Lamb from a lowland farm will have a slightly lighter taste to a hillside reared animal. What to look for when buying lamb? A joint of lamb should have a good depth of lean meat covered by a moderate layer of fat and the skin should be firm but pliable to touch, not hard or wrinkled. Meat from a young lamb is usually pale pink but remember some hill lambs have a deeper colour. The fat, including any marbling within the cut, should be creamy white, not oily or yellow. Visit our 'how to roast lamb' page for more information on lamb. Lamb is a versatile meat that can be cooked in a variety of ways to produce a massive array of superbly tasty recipes. Meat cut from the neck, shoulder, breast, saddle and legs is ideal for oven roasting; the ribs are good when cut into lamb cutlets while meat from the loin of the animal is suited specifically for roasting whole, or cut into pieces as chops. Various cuts are used diced for stewing, braising, grilling and mincing.